This image indicates the current location of the "red can" in Butte county, CA. I moved the can to the base of the tree with the plaque from its incorrect location in Plumas county. 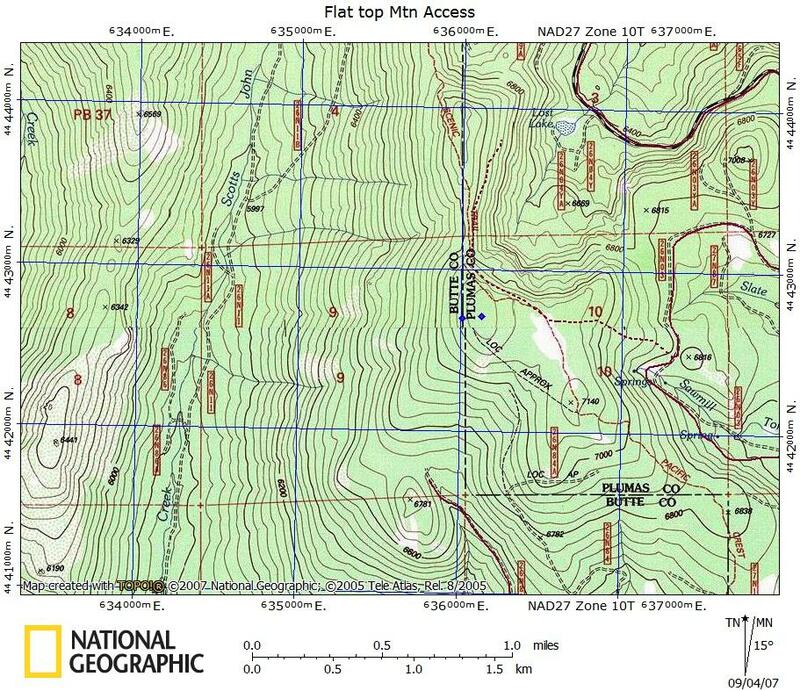 My GPS read 636010E, 4442698N (NAD27) at 7,142 feet, which corrected for the fact that I had it in my hand 2 feet above the ground would make the highpoint 7,140 feet as reported. You can see from the waypoint that the tree is on the county line. The waypoint to the right (in Plumas county) which is where the red can previously resided was at 636131E, 4442710N (NAD27) at 7,180 feet. Diane and I searched high and low for the can mentioned in Ken Jones report and were unable to locate same. Perhaps the plaque has replaced the other can.